Born at Natice, Kentucky, May 11, 1888, he entered the Navy in 1904 and later graduated the Navy War College Senior Course. He was advanced to Captain in 1936, Rear Admiral in 1942 and to Vice Admiral in December 1944. He served as Assistant Chief of Staff to the Commander in Chief, United States Fleet to February 1942. He was appointed Commander, Task Force, Southwest Pacific, in February 1942 and was in command when five Japanese ships were sunk in the naval engagements of the Solomon Islands, November 1942. He was best remembered for his decisive action at Guadalcanal in 1942. He turned the tide there with his group of battleships and cruisers. At a critical moment, when victory hung in the balance, he radioed the message, "Stand aside, I'm coming through. This is Ching Lee." In the Spring of 1944 he and Admiral Marc A. Mitscher directed attacks on Truk Islands and the Japanese strongholds in the Carolines. At Formosa and the Ryukus in the Fall of 1944, he was second in command to Admial William F. Halsey, Jr. He died near the end of the war while conducting research to counter Japanese Kamikaze attacks. He was buried in Section 6 of Arlington National Cemetery. 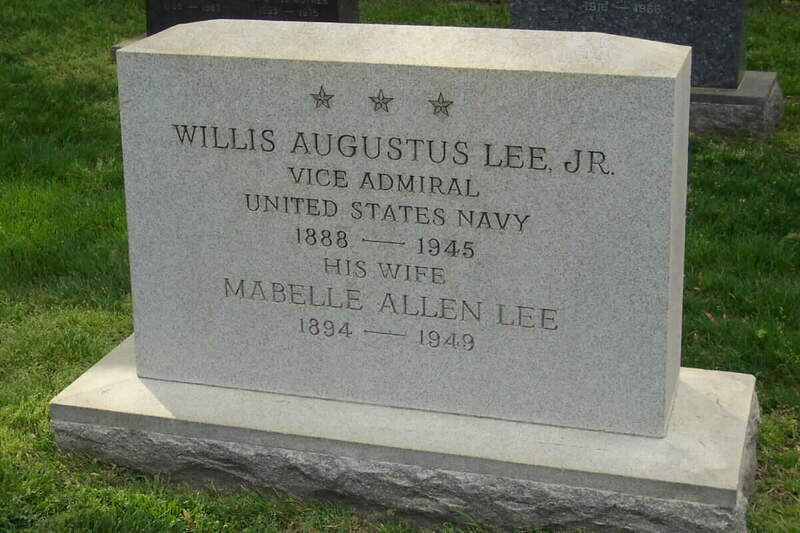 His wife, Mabelle Allen Lee (1894-1949), is buried with him. 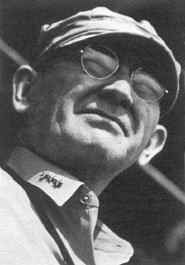 Willis A. Lee, Jr. was born in Natlee, Kentucky, on 11 May 1888. He graduated from the U.S. Naval Academy in 1908. Over the next two decades, he served in several ships and on shore duty as an inspector of ordnance, while also representing the Navy in rifle competitions. He was Commanding Officer of three destroyers during the 1920s and attended the Naval War College late in that decade. During the 1930s and early 1940s, Lee was several times assigned to the Fleet Training Division, commanded the light cruiser Concord, and served on the staff of Commander, Cruisers, Battle Force. In early 1942, following his promotion to the rank of Rear Admiral, Lee became Assistant Chief of Staff to the Commander in Chief, U.S. Fleet. In August 1942, Rear Admiral Lee was sent to the Pacific to command a Battleship Division. Flying his flag in USS Washington (BB-56), he was active through the Solomons Campaign and lead his force to victory over a Japanese surface force off Guadalcanal on 14-15 November 1942. He was later promoted and placed in charge of the Pacific Fleet's fast battleships. In May 1945, he was sent to the Atlantic to command a special unit researching defenses against the Kamikaze threat. While serving in that position on 25 August 1945, Vice Admiral Willis A. Lee died suddenly after suffering a heart attack. Additional interesting fact about Admiral Lee was that he was a world-class marksman. He was part of the US Olympic shooting team at the 1920 Games in Antwerp, which won 7 medals, including 5 gold. Lucy Lee ("Lute") was the daughter of Willis Augustus Lee. His brother, Jefferson Davis Lee, was my grandfather on my mothers side of the family. They were the sons of Nathaniel Lee and they grew up in Natlee in Owen Co. Ky. Lucy Lee was born February 21, 1881 in Owenton, Kentucky where her father was a lawyer and judge. She had three siblings: Curtis Lee (1883-1890), Roberta Lee ("Sweet") March 18, 1886 - d.(? ), and Vice Admiral Willis Augustus Lee, Jr. ("Mose") (May 11, 1888-August 25, 1945). 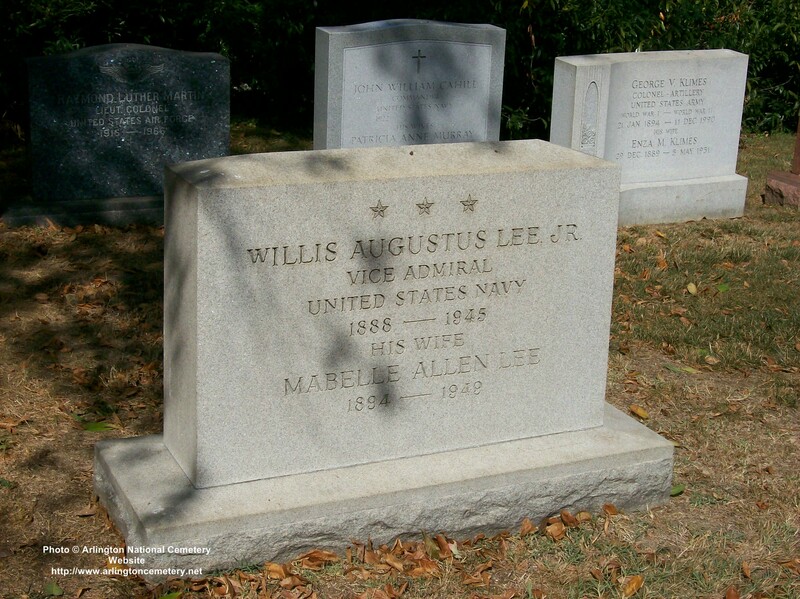 Admiral Lee was Kentucky's highest Naval office and is buried in Arlington National Cemetery with his wife, Maybelle Elspeth, whom he married July 14, 1919. They had no children. He was commander of the battleship Washington and was a hero in the Battle of Guadalcanal during World War II. According to my material, Lucy and James Vallandingham had three children: James Lee Vallandingham (February 6, 1904-June 9, 1951); Willis Lee Vallandingham (September 6, 1914 - d.? ); Elizabeth Lee Vallandingham (August 3, 1915 - d.?). 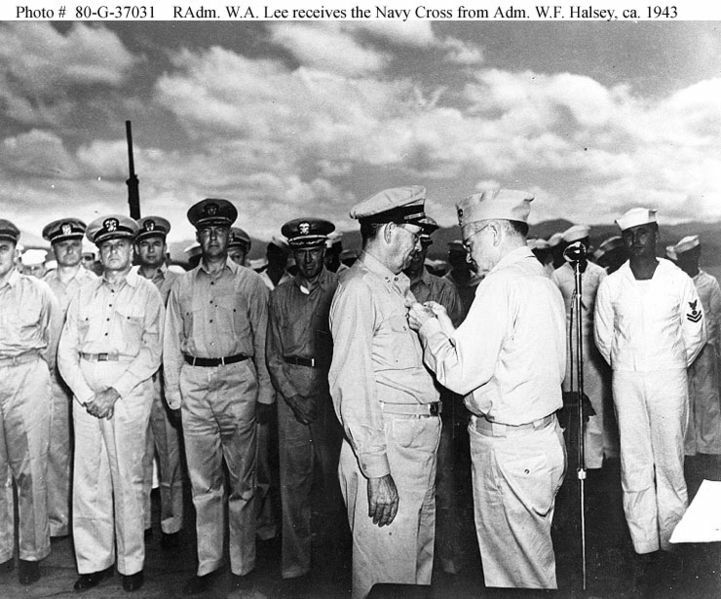 The Navy Cross is presented to Willis A. Lee, Rear Admiral, U.S. Navy, for extraordinary heroism and distinguished service in the line of his profession as Commander, Combat Division SIX, during an engagement with Japanese naval forces near Savo Island on the night of 14 - 15 November, 1942. Rear Admiral Lee sought out and engaged an overwhelmingly powerful foe and in the furious battle that followed destroyed at least one Japanese battleship, three cruisers, and one destroyer; damaging several others, and turning back the remainder of the enemy fleet, thereby frustrating a formidable Japanese offensive. Rear Admiral Lee's inspiring leadership and the valiant devotion to duty of his command contributed in large measure to the outstanding success of these vital missions and reflect great credit upon the United States Naval Service. The United States Naval Academy's rifle team will honor the late Vice Admiral Willis Augustus Lee, Jr., USN '08 on Saturday, August 25, at 11 a.m. The date marks the 56th anniversary of Lee's death. The team will lay a wreath on Lee's grave, located in Section 6 of the Arlington National Cemetery in Arlington, Virginia. "Vice Admiral Lee personifies everything that we expect in a midshipman/athlete," said Navy rifle coach Bill Kelley. "He not only holds the record for the most medals won in shooting in the Olympic Games, but he had a long and distinguished military career, rising to a three-star Admiral and winning the Navy Cross." Lee represented the United States in the 1920 Olympic Games in Antwerp, Belgium. A member of the country's shooting squad, Lee took home seven medals (tying teammate Lloyd Spooner for most in the Antwerp Games) - five gold medals (tied for most at Antwerp with Italy fencing standout Nedo Nadi), one silver medal and one bronze medal. Lee was born in Natlee, Ky., on May 11, 1888. Upon graduation from the United States Naval Academy in 1908, he served in several ships and on shore duty as an inspector of ordinance over the next couple of decades. 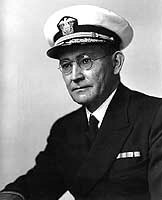 Lee was Commanding Officer of three destroyers during the 1920s, a decade in which he also attended the Naval War College. Lee was assigned on numerous occasions to the Fleet Training Division in the 1930s and early 1940s, as well as commanding the light cruiser Concord and serving on the staff of Commander, Cruisers and Battle Force. Early in 1942, soon after being promoted to the rank of Rear Admiral, Lee became an Assistant Chief of Staff to the Commander in Chief, U.S. Fleet. Lee was sent to command a Battleship Division in the Pacific during August of 1942. Active through the Solomons Campaign, Lee led his force to victory over a Japanese surface force off Guadalcanal from November 14-15 of the same year. At a critical point in that battle, Lee took charge, radioing the message, "Stand aside, I'm coming through." He later was promoted, having been named to oversee the Pacific Fleet's fast battleships. After being promoted to Vice Admiral in December, 1944, Lee came to the Atlantic to command a special unit that researched defenses against Japanese Kamikaze threats in May, 1945. It was while serving that position that Lee suddenly died of a heart attack on August 25, 1945.